You found the perfect beach glass. You made the perfect fused glass cabochon. Now you want to drill the glass to use it as a component for jewelry. This tutorial will show you how to drill found beach glass, fused glass cabochons and components or any other glass your want to repurpose or upcycle. Determine the size hole you need and select a ball burr and drill bit. Always use diamond coated drill burrs and bits to drill your glass. Do not use carbide bits to drill glass. It is important to keep the drill bit from skipping or moving when you are beginning to drill a hole. A drill press will hold the bit firmly in place as you work. Create a small divot in the glass with a ball burr. The divot will prevent the drill bit from skidding across the glass as you drill. You will need a lubricant to keep the glass cool when you create the divot and later as you drill. Most people use water. Place the object being drilled into a shallow pan or tray. Fill the pan with just enough water to cover the glass. Place a thin wooden board or Styrofoam in the bottom of the pan to prevent you from drilling through the bottom of the pan (resulting in a huge, wet mess). Switch from the ball burr to your drill bit. Avoid twisted bits for drilling glass. Match the bit size to the size hole you desire. Usually, you will want a ball burr that corresponds in size to the drill bit. For large holes, however, it is often preferable to begin with small bits and move up to large size burrs and bits to enlarge the hole. The tip of the drill bit should be kept wet at all times when drilling. Use enough water so that the "dust" from the hole does not become air borne. The drill "dust" should become a very wet paste. If at all possible, have a small amount of water constantly running over the drill tip and bore hole as you work. If you are unable to have fresh water running over the drill hole, stop from time to time and replace the dirty water with fresh, clean water. Begin drilling at a very slow speed with very light pressure and plenty of lubrication. You can increase all three as you become more comfortable with drilling. Faster drilling often results in wearing out bits more quickly, so you will need to balance the cost time spent drilling balances against the cost buying more drill bits. To drill holes 1/4" and larger or to drill holes in thick glass like glass block or wine bottles, select a diamond hole saw (also called a hollow core drill bit). Be sure to use plenty of lubrication/coolant when drilling. Lubricant will keep your drill tip cool and the hole clean and chip free. Lubrication reduces heat build-up while drilling. in other words, the water will help prevent the glass from breaking when you drill. Water will also protect the diamond drill bit as you work. Some glass is harder than others, depending on COE, color, mineral content and other factors. Be aware that you may need to add lubricant as you work-- especially when drilling harder materials. Always let your drill bit drill at it's own natural pace. Do not add pressure to the drill. Start diamond hole saws at 600-900 RPM. Start diamond drill bits at 2500-5000 RPM. Diamond bits come in several different grits, Extra Fine (360 grit), Fine (200 grit), Medium (120 grit), Coarse (95 grit) and Super Coarse (75 grit). Do not use diamond coated drill bits and burrs on steel or other ferrous metals. 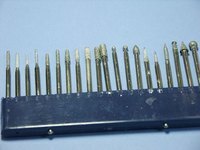 Use carbide bits and burrs on iron, steel and other ferrous alloys. If you want to drill glass with a hand drill or rotary tool (like a Dremel or Flex Shaft) you may want to create a jig to keep your hole centered and even. To do so, drill a hole in a piece of 1/8" thick wood, 1/8" Plexiglas or cardboard. Place this drilling jig on the glass being drilled, with the jig over your target spot on the glass. Clamp the jig over the glass. The jig will keep the diamond bit centered in place while you start the hole with your hand drill or rotary tool. If you find drilling in a pan awkward, you can build a "dam" around the drill hole of your glass using polymer clay to trap water around the glass as you drill. Take care and use common sense when working with water around power tools. Wear eye goggles when drilling glass.